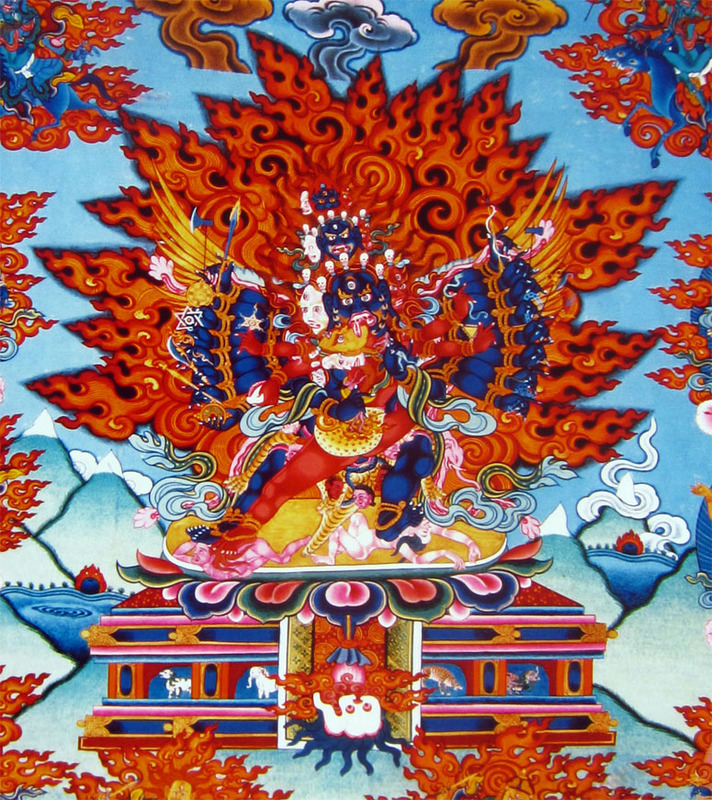 In the Yungdrung Bön tradition, there is a group of five yidam deities from the Father Tantra who embody the Enlightened Body, Speech, Mind, Quality and Activity of the Enlightened Lord Tönpa Shenrap Miwoche. This group of five yidam deities is collectively known as the Sé Khar Chok Nga, The Five Supreme Embodiments, or literally The Five Divine Fortresses. The yidam deity, Walsé Ngampa is the embodiment of Enlightened Body. He is dark blue with nine heads and eighteen arms with which he holds various weapons for subduing obstacles. 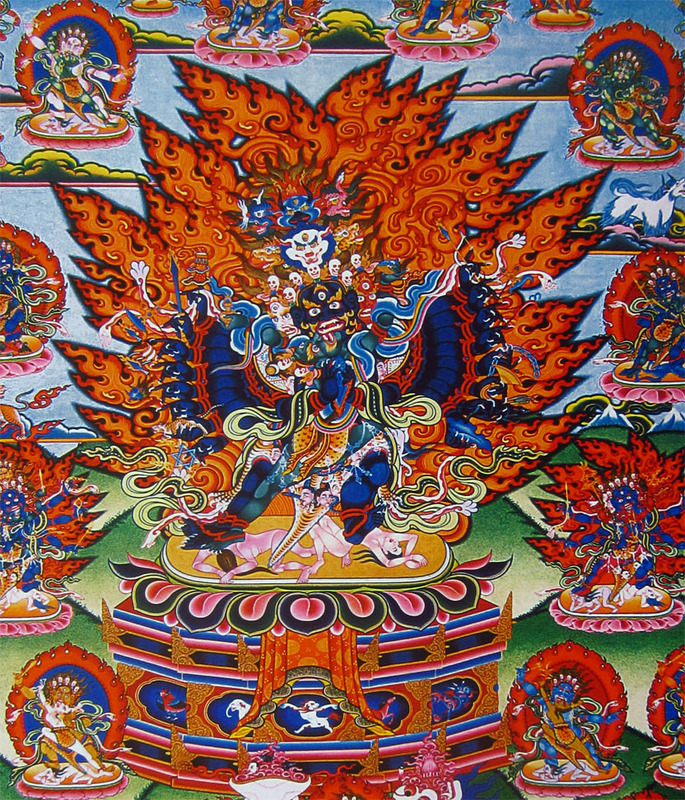 The main ritual text for this deity is entitled, “Stages of Practice for Walsé” which was composed by the great sage Drenpa Namkha. His consort has the peaceful nature of the enlightened Great Mother Satrik Érsang and is known as Ngammo Yumchen Tröpé Taktenma. Her body is dark green. 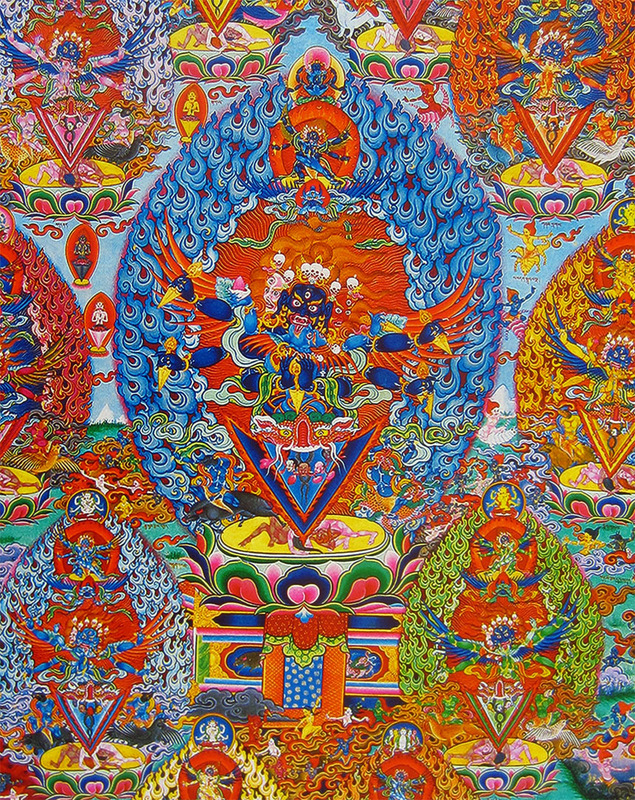 The yidam deity, Lhagö Thokpa, is the embodiment of Enlightened Speech. He is dark blue with four heads and ten arms with which he holds various weapons for subduing obstacles. This yidam is not widely practiced at present. His consort has the nature of Sipé Gyalmo and is known as Jangnak Tröma. Her body is dark green and she has blue turquoise-colored hair. 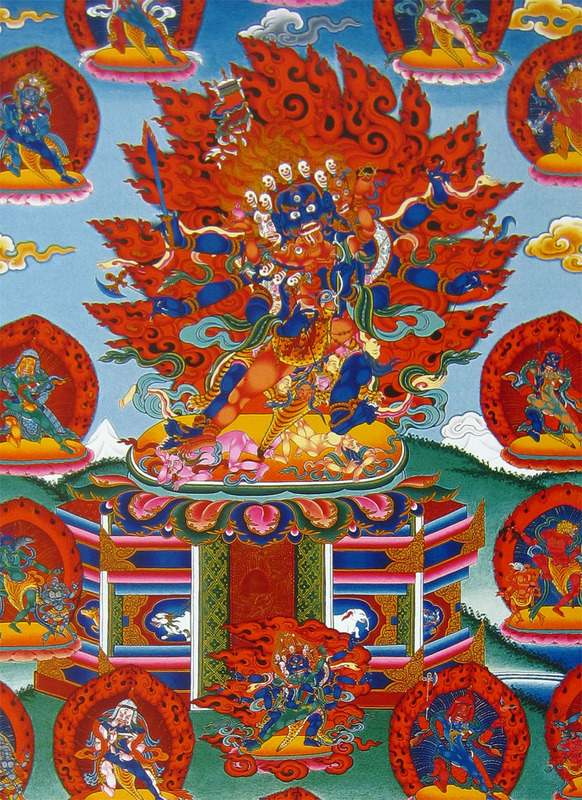 The yidam deity, Trowo Tsochok Khagying, is the embodiment of Enlightened Mind. He is dark blue with three heads and six arms. The main ritual text for this deity is known by the abbreviated title, “The Great Empowerment of Trowo.” His consort is Khala Dukmo. Her body is red and she wears a sun, moon and stars as a head ornament. The yidam deity, Walchen Gekho, is the embodiment of Enlightened Quality. This deity is closely associated with the ancient kingdom of Zhang Zhung and Mt. Tisé (Mt. Kailash). He is dark blue with nine heads, four legs and the wings like a garuda. He has eighteen arms with which he holds various weapons for subduing obstacles. There are five tantric texts associated with the yidam. One of them was compiled by the esteemed first abbot of Menri Monstery, Nyammé Sherap Gyaltsen, and is entitled, “Secret Fierce Gekho.” His consort is the queen of the Drala and has a body that is red. 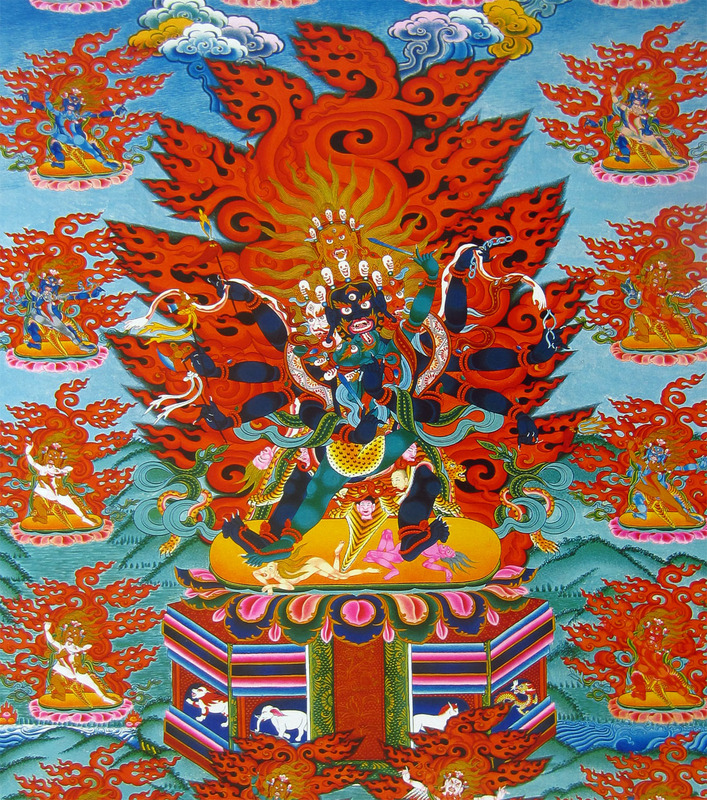 The yidam deity, Walpur Drukse Chempa, is the embodiment of Enlightened Activity. This yidam is also referred to as Phurba. He has three faces and six arms, each of which are holding a phurba, or ritual dagger. He and his consort’s body are joined below the waist and form a single phurba adorned with snakes. Both the yidam and his consort have wings. There are many ritual texts associated with Trowo Drukse Chempa. Posted on June 5, 2016, in Iconography, Prayer and Ritual, Tonpa Shenrap, Uncategorized. Bookmark the permalink. 5 Comments.